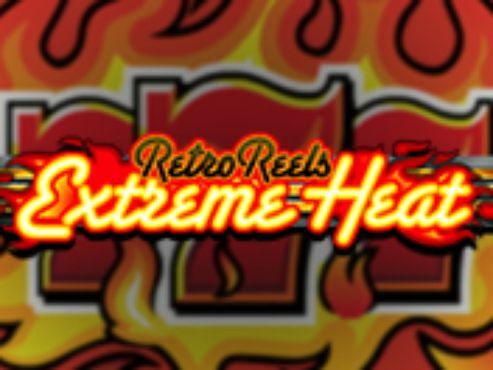 Anyone looking for reel retro action is going to find it on the 40 Super Hot slot game. This five reel adventure comes with an amazing jackpot prize of 1200000 and 40 paylines. 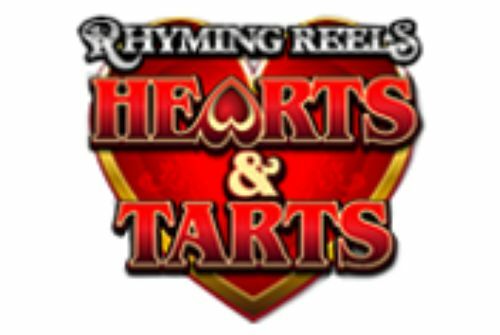 A number of high-paying symbols, including the most valuable one in the star, will make the reels sing, for the luckiest players out there. 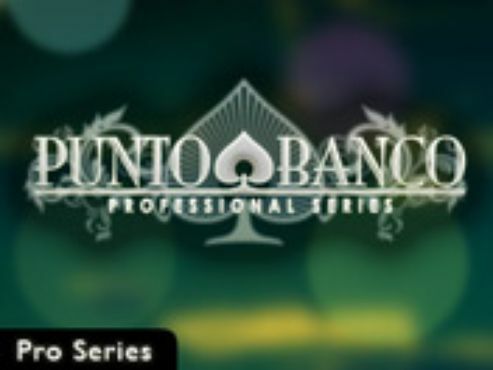 Although there isn't a free spins bonus, the game offers a thrilling adventure that can be player for bets that are as small as 0.01 per payline. It was a pleasure telling you all about the 20 Super Hot game made by EGT Interactive. 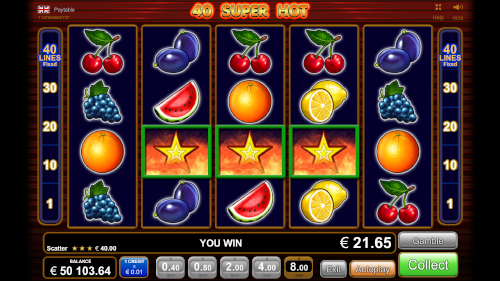 This time around, we are raising the heat to 40 degrees with the 40 Super Hot slot. 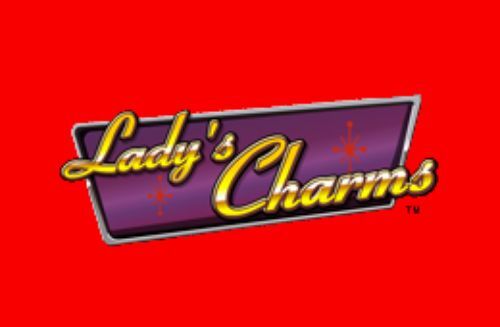 This is basically the same game, so you will discover the same symbol and grid layout, as well as buttons and range of bets. So what is different then? Well, for starters there is an additional row, so instead of the three rows and five reels of its predecessor, the 40 Super Hot has four rows and five reels, spinning on 40 fixed paylines. This is not all about all the things that exist on the surface of this slot game. What is more are the amounts on the potential cash prizes that can be won in the game. Speaking of big cash prizes, the game has four jackpots, and these are all represented as tickers, whose numbers are rising as the player progresses through the game. The in-game jackpot prize sings to the tone of 60,000 coins or 1,200,000 for the game's biggest cash prize. Whether you play for fun or for the potential win, the 40 Super Hot slot has substance and lots of potential for a fun-loving slots adventure. Setting up the game has been made so easy on account of how few clicks you need to make in order to set the reels spinning, and according to your prefered wager. You will immediately notice that in the bottom of reels grid are five windows with a number in them, and a blue button with the wording 'credit' on it. 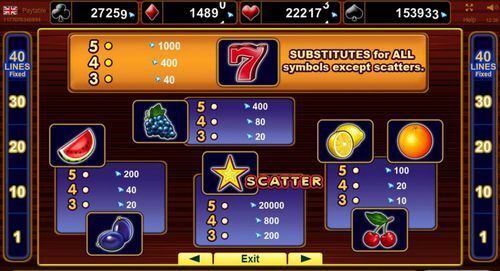 This is your control board to Spaceship 40 Super Hot slot, as you just need to select the credit level (between first, second and third) and then select the box whose number best corresponds to your idea of what represents a decent bet, and one that is sustainable for your account. That being said, from there on it is all just clicking the number that you like. In this game the cash value is represented in your currency but in some instances it may be represented by a number of credits that you purchase with a specific sum of money. As for the paylines, these are fixed at 40, which means no winning outcome will ever escape if or when it were to occur. Then there is the paytable, which can be called in from the 'i' button, to the left of the Autospin button. The paytable is dynamic, meaning, when you change the bet and credit amount you will see precisely how much credit each winning symbols can bring. The game design is rather simple but regal at the same tim and in this edition, the extra row just adds another line of excitement to the reels grid. The top is reserved for the four tickers that count up the rising of the four jackpot levels. Hovering your mouse arrow above these windows will display information about the latest win and the largest win. As for the symbols, they are as retro as they could get. The 40 Super Hot slots makes it plain to see why so many people call slot machines 'fruities' - it's because of all the fruits spinning on the reels. You will get an eyeful of grapes, oranges, plums, cherries, watermelons and lemons. In addition to these there are the specialty symbols in the gold star, representing the Scatter, and there is the lucky or crazy seven (depending how you know it) which is the Wild and substitutes for all other symbols except the scatter. Pro players don't ask the question 'how to win a slot game?' for a very simple reason. They know that the winning outcomes are delivered at random, meaning, they know that everything is left to the whim of Lady Luck, and they know how to enjoy themselves having this wisdom in mind. Whatever the case, the 40 Super Hot slots has some astounding amounts that could be won, so you can never know if one of the top payouts will strike during your play. 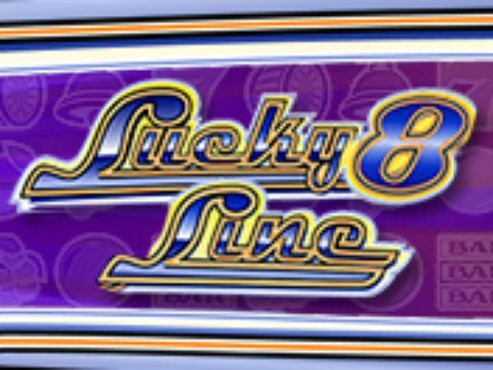 That being said, off the specify the prizes that make this online slot so lucrative. For starters, let's take into account the four jackpots. They go up in size, so make sure to check which one is what at the moment when you are playing. Then there are the in-game prizes. Playing with the maximum bet you are looking at a 60,000 prize for a string of five matching Wild symbols, and an avalanche of 1,200,000 credits if you ever see five scatter symbols on the reels grid. If you are ready to embark on the retro slots adventure called 40 Super Hot slot, you can start by claiming a welcome bonus at one of the casinos right on this page.